An AirAsia plane with 162 people aboard went missing en route from Indonesia to Singapore on Sunday morning shortly after the pilots requested a change of flight plan because of weather, the third major aviation incident this year involving a Malaysian carrier. 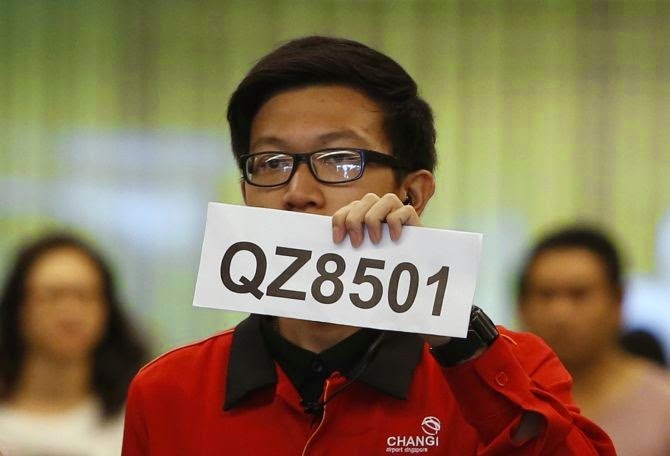 AirAsia Flight QZ8501 with 155 people on board -- including one British, one Malaysian, one Singaporean, three Koreans, -- and seven crew members lost contact with air traffic control at 07.24 am local time Indonesia. Sixteen children and one infant were among the passengers on board the AirAsia Airbus A320-200 that went missing on the flight from Surabaya, Indonesia, to Singapore. At a press conference this morning, Indonesian officials said the plane was several hours past the time when its fuel would have been exhausted. There were unconfirmed media reports that a aircraft crashed in the waters of East Belitung, off the east coast of Sumatra. The exact location of the crash site has not been identified, media reports said. The aircraft was in the Indonesian flight information region, more than 200 nm southeast of the Singapore -- Jakarta FIR boundary, when contact was lost, civil aviation authority of Singapore said. The plane took off from Surabaya (Indonesia) at 5:20 am local time and was scheduled to land at Singapore's ChangiAirport at 8.30 am. A statement on AirAsia's Facebook page said: "AirAsia Indonesia regrets to confirm that flight QZ8501 from Surabaya to Singapore has lost contact with air traffic control at 07.24 am." "At the present time we unfortunately have no further information regarding the status of the passengers and crew members on board, but we will keep all parties informed as more information becomes available," the Malaysia-based carrier said in a statement. "At this time, search and rescue operations are in progress and AirAsia is cooperating fully and assisting the rescue service," the statement said. Indonesian Transport Ministry official Hadi Mustofa said the plane had asked for an unusual route before it lost contact, local media reported. Air Asia said the pilot had requested "deviation" from its flight plan because of bad weather. "The aircraft... was requesting deviation due to en route weather," it said. Indonesia's national search and rescue agency bangka belitung said it has dispatched one vessel to search for AirAsia flight QZ8501. "We received information from Basarnas in Jakarta that contact had been lost with an AirAsia flight over Bangka Belitung waters...We then dispatched a vessel with a search and rescue team of 22 members to check the information," Febi Imam Saputra, an information official at Basarnas Bangka Belitung, was quoted as saying by the Indonesian Antara news agency. "If we look at the map, these coordinates refer to an area around 20 nautical miles from East Belitung," said Febi. Indonesian authorities have mobilised search and rescue operation near BelitungIsland, deploying five ships and a surveillance aircraft carrying 15 Indonesian Air Force personnel. The Civil Aviation Authority of Singapore has confirmed that it is linking up with Indonesian authorities to help locate the missing plane. Australia and Malaysia have also offered assistance. A massive search is underway for the missing plane. The last detected position of the missing AirAsia Indonesia Flight QZ8501 is believed to be between Tanjung Pandan on BelitungIsland and Kalimantan, Indonesia, according to Indonesia's Director of Air Transport, Djoko Murjatmodjo. "The position where contact was lost was between Tanjung Pandan and Pontianak, about 100 nautical miles south-east of Tanjung Pandan," said Djoko. The pilot Captain Iriyanto has an experience of 6,100 flying hours. AirAsia Group CEO Tony Fernandes has asked his company to stay strong. "Thank you for all your thoughts and prayers. We must stay strong," tweeted Fernandes, an ethnic Indian, who set up the budget airlines which now flies to several countries. Fernandes has said that he is heading to Indonesia. Malaysia has also offered assistance in the search operation. AirAsia is popular in the region as a budget carrier. It has about 100 destinations, with subsidiaries in several Asian countries. The loss of contact with the AirAsia plane comes nearly 10 months after the disappearance of Malaysia Airlines Flight MH370, which went missing on March 8. Searchers are yet to find any debris from Flight MH370, which officials believe crashed in the southern Indian Ocean. Another Malaysia Airlines plane MH17 was shot down over Ukraine in July, killing all 298 on board.